For most fishermen, catching a record-sized fish can be an unobtainable goal. Not so for Colton Lambert, who at 12 years old became the envy of many bass anglers when he pulled in the largest largemouth the state of Maryland had ever seen. According to the state Department of Natural Resources, Lambert was fishing with his father at a pond in his hometown of Huntingtown in late July when the fish struck. His father had good reason to do so, the largemouth weighed 11 pounds and six ounces, measuring in at 26 inches long and 18 inches around. The Lamberts knew they had a contender to beat Maryland’s near 30-year record. The bass was stored in a bucket and taken to a nearby tackle shop the next day for the official weigh-in on a certified scale. Despite the fish’s already impressive weight, fisheries biologist Keith Lockwood commented that the bass could have been a lot heavier if it had been properly fattened. Lockwood then went on to check if proper procedures were followed after the catch, later confirming the bass as the new state record. The previous record belonged to a 11-pound, two-ounce largemouth caught by Rodney Cockrell in a private pond almost three decades ago. The young angler’s achievement will be recognized at the finale of the 2013 Maryland Fishing Challenge, a year-round competition that celebrates the fishing opportunities of Maryland. The state’s new largemouth record places it near the middle of the pack when comparing other states’ top bass. 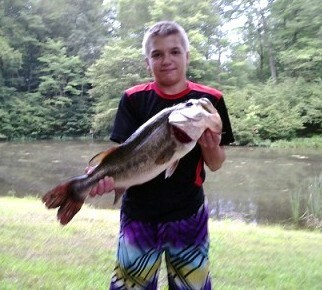 According to landbigfish.com, largemouth bass of weights beyond 16 pounds are not uncommon. Mississippi’s current record stands at 18 pounds, 2.4 ounces while California boasts a behemoth largemouth weighing 21-12. The national—and world—record is still held by Georgian angler George Perry’s legendary 22-4 fish. Perry’s record is holding strong after 81 years, but it has been matched by a Japanese angler who caught a fish that tied Perry's in the IGFA record books.